Are you so sick of reading about my laundry room yet?? We're almost done! If you recall, after Day 2 the room was ready to be grouted. 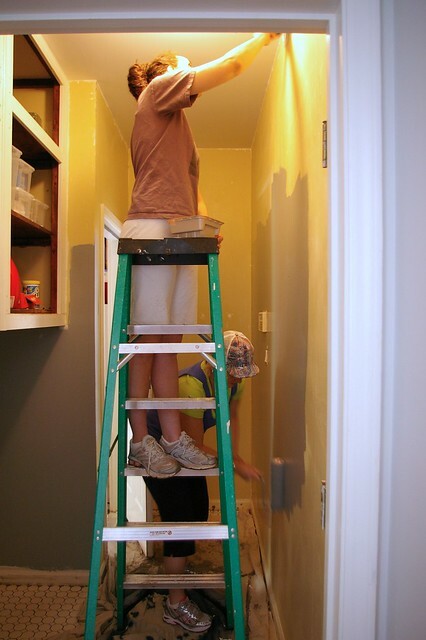 We knew the grouting process takes at least 16 hours to dry, so we decided it would be best to paint the room first. Right off the laundry room is the same very light gray/blue that is in our living room and entry (you can see it in the above image to the far right). 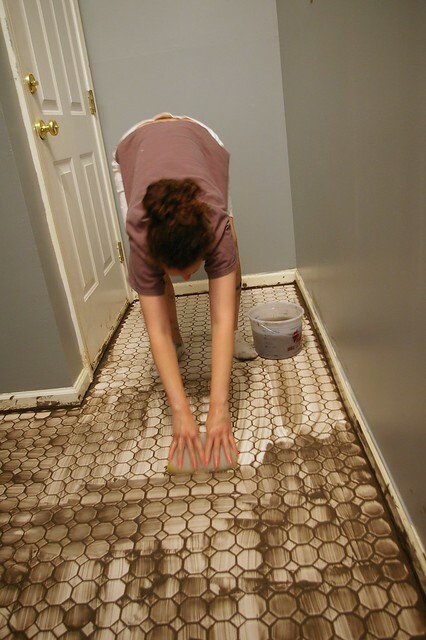 After the room was painted, it was time to grout! This was a very messy step, but again.. not too hard. As you can see, I decided to paint the cabinets in chalkboard paint. This will be a great place to write to-do lists, shopping lists, etc. We still have a lot to do today (including the threshold strips in front of the doors as you can see). But today will be more of a "fun" day! I hope to have a finished reveal soon! ps- with all this work in the laundry room, I am behind on putting together the May giveaway. I'll try and post one as soon as I can, sorry! pps- I'm so happy and proud to be an American today!!!!!!!!!!!! WOW!!! That looks so good! Love the paint color. You and the hubby and the MIL should treat yourselves to something very special after its done! I'm so excited to be an American, too! Just simply gorgeous. You guys did a wonderful job, and it all fits together so so well. Love your selections!! This looks great. I dream of the day I have a laundry room. Currently ours is a laundry closet. The contractors who updated this house made it convenient (it's right outside our bedroom door) but really....there isn't even any space to put detergent in with the machines! Oooh, and with the chalkboard cabinets....once you have kids, if they are missing something or you find a random sock without a mate you can leave notice. It'll be a great clothing related message board! I like!! The floor looks great and so does the wall color. I like the idea of using chalk board paint on the cabinets to create lists etc! The tile is just adorable...the cleaning is the worst part! Can't wait to see it all! Are you excited for blogfest? OMG. I am soooo proud of you. What an amazing job you have done. And way to go MIL!! Brynn, did you hook up (and unhook) the washer and dryer yourself? What was involved? 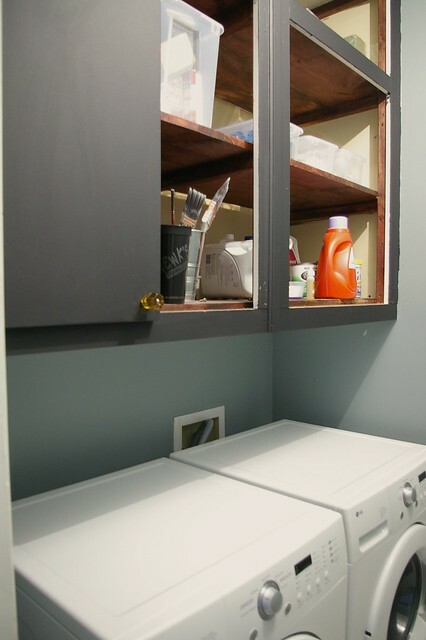 I have a laundry room about the same size and while the tiling doesn't scare me, disconnecting/reconnecting the appliances does! Love it. I have chalkboard paint on my laundry room cabinets and love it. Great job. It's really coming together! 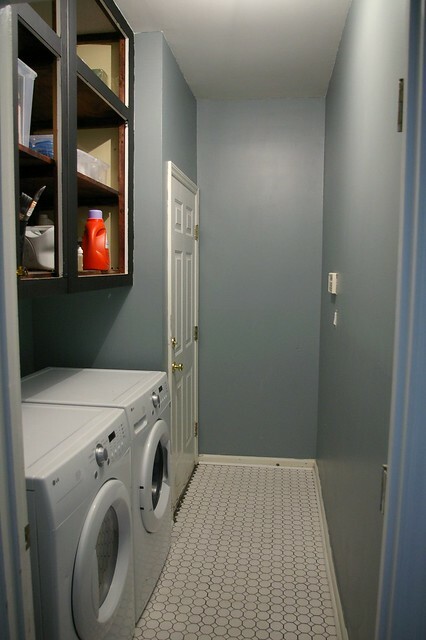 I love a pretty laundry room and yours is going to be awesome- the wall color and tile alone are great! All that hard work is paying off! The tile is perfect. I would choose the same for myself! And I L-O-V-E LOVE! the chalkboard paint for the cabinets. I am so going to copy you. Oh my gosh...after all that work...a spa day :) It is looking SO good and I love the chalk board idea in there. It's looking just fantastic, Bryn!! Love the process, Bryn! 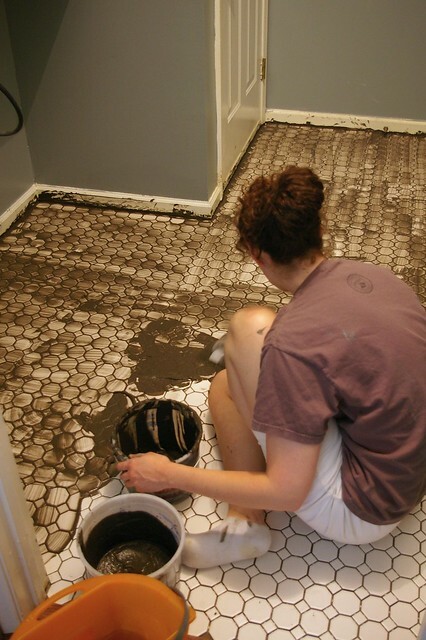 One question (and this may be totally stupid) but why do you tile under the washer and dryer? Love it, I did my laundry room too and to cover the box with the hoses, I made a curtain out of one curtain panel(cut 4 part out of it) it looks great.